This Louis Vuitton Cannes Beauty Case came into our atelier with a broken handle. Following the assessment and the extent of the damage the atelier team set to work to rebuild new handles. From sourcing the exact leather to creating the patterns for the handles, follow the journey of this coveted piece. We can’t help feeling nostalgic about Céline and it seems MINT Journal editor Irina Lakicevic shares our sentiments. Taking into account the characteristics of vegetable tanned leather; The Restory artisans set out to breathe new life into her very first Céline, the Tie Tote bag. We let the results speak for themselves. Transcending seasons, Gucci is continuously on top of the accessories game. So when we received several vintage Gucci designs, it was unanimously agreed it would make the ultimate case study to take these under the loop together. Read on to see how we revived some of this season’s hottest accessories. 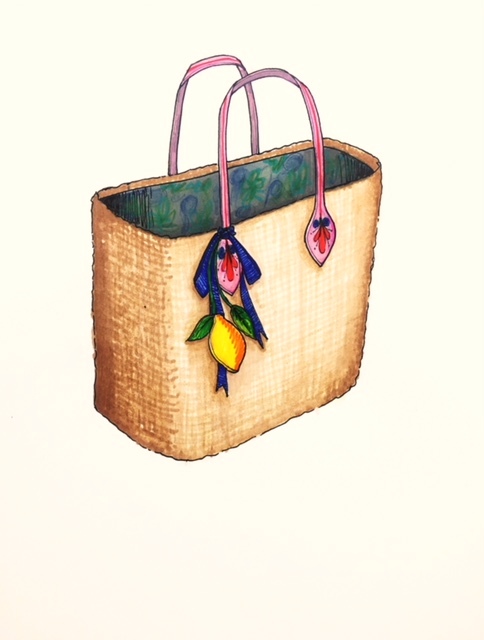 A simple summer basket can be transformed into a bucket bag, a tropical tote or in this case even a backpack. The beauty of our bespoke services is that any design idea can become a reality. 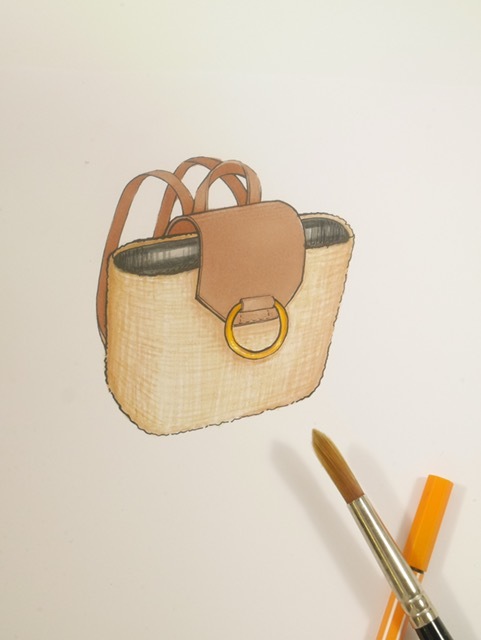 Be inspired by the transformation of a wicker tote into an all round classic piece. 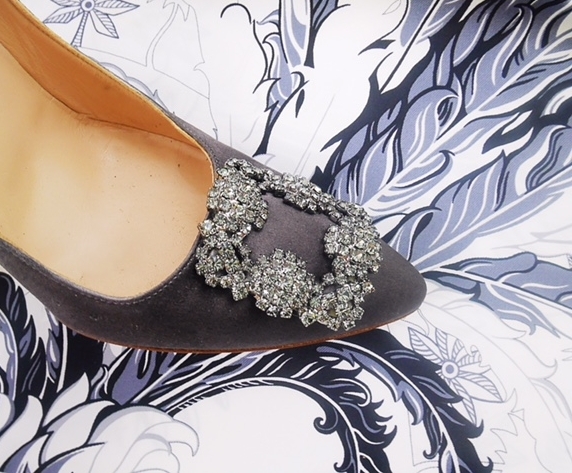 Follow the journey of a pair of Manolo Blahnik Hangisi pumps from Ivory silk satin to Gunmetal Grey, courtesy of The Restory colour experts; how a happy coincidence turned out to be the perfect shade. It's impossible not to get excited whenever we receive a Hermès Kelly at our atelier and this time we had the chance to restore a beautiful heirloom piece that could use a bit of The Restory magic. Highlighting another regular at our atelier, we recently restored the Christian Louboutin New Declic python pumps. See the intricate procedure of restoring exotic leathers. 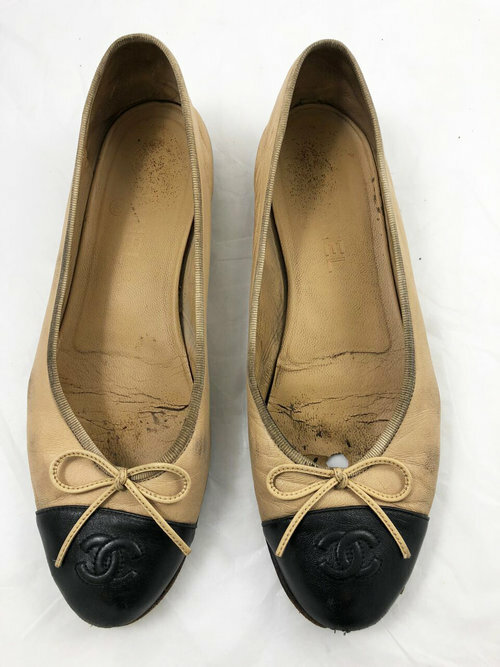 The Chanel flats are a favourite among The Restory’s clients and often worn until their very last breath. So we decided it was high time to put the spotlight on this timeless classic. We recently had a request from a client who wanted to bring his very unique card case back to life. See how we revived this special piece partially made out of stingray leather. 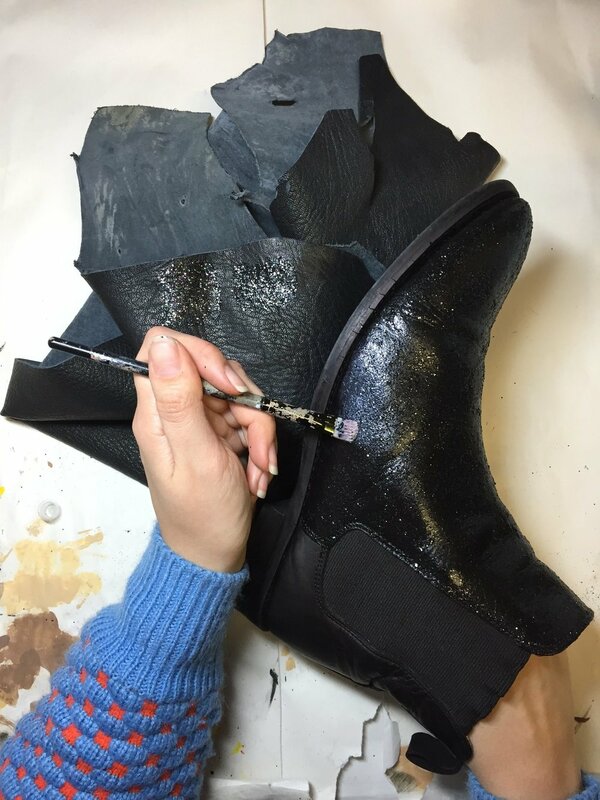 Our Head of Atelier reimagined her chelsea boots from burgundy to black with a touch of glitter. See the process and be inspired by the possibilities to reimagine your items. 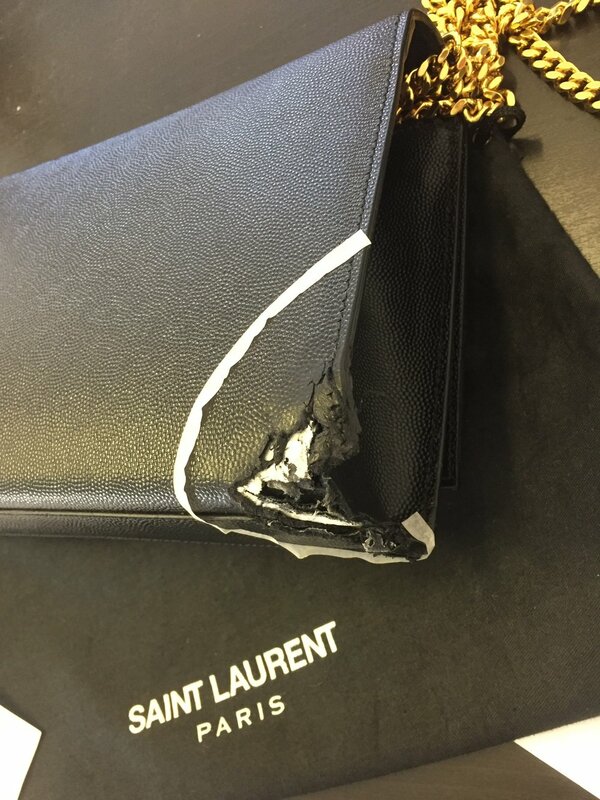 Our client came to us with little hope of repairing her new Saint Laurent bag that was chewed by her puppy. 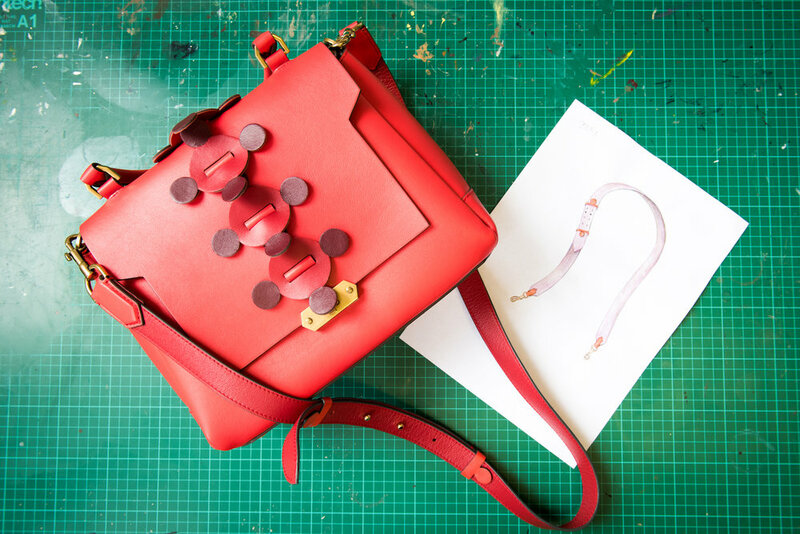 Our team worked closely with her to creatively repair the bag, adding its own unique addition. Fendi has been reviving its traditional logo fabric over the past seasons and this was the perfect opportunity to take a closer look at the remake of an iconic piece. This Anya Hindmarch originally came with a canvas strap. 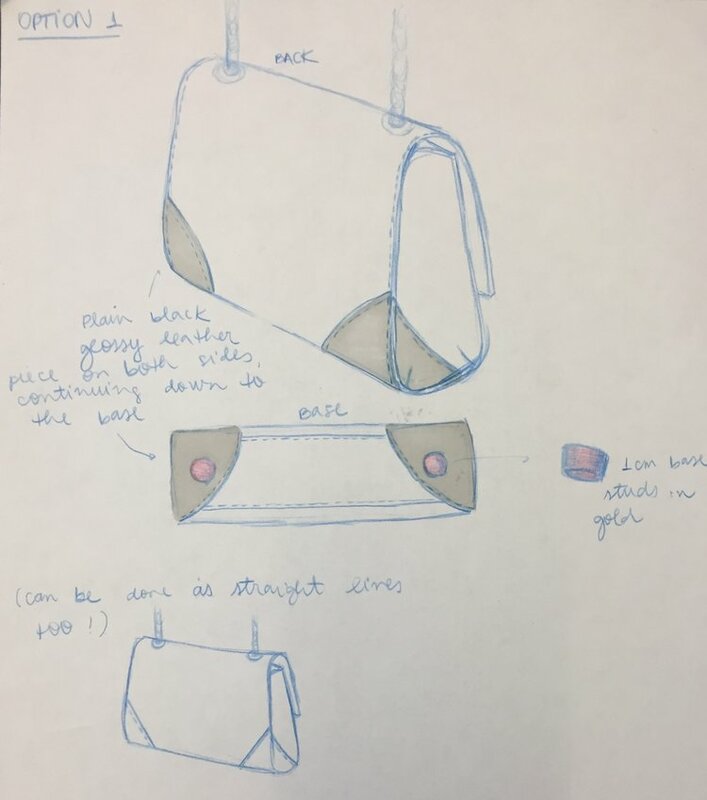 Our client was after an additional leather strap, an elegant long option to go with the design of the bag, see the process of designing and creating it. When our client wanted to update her white Chanel to be black, preparation and care treating the leather was key. 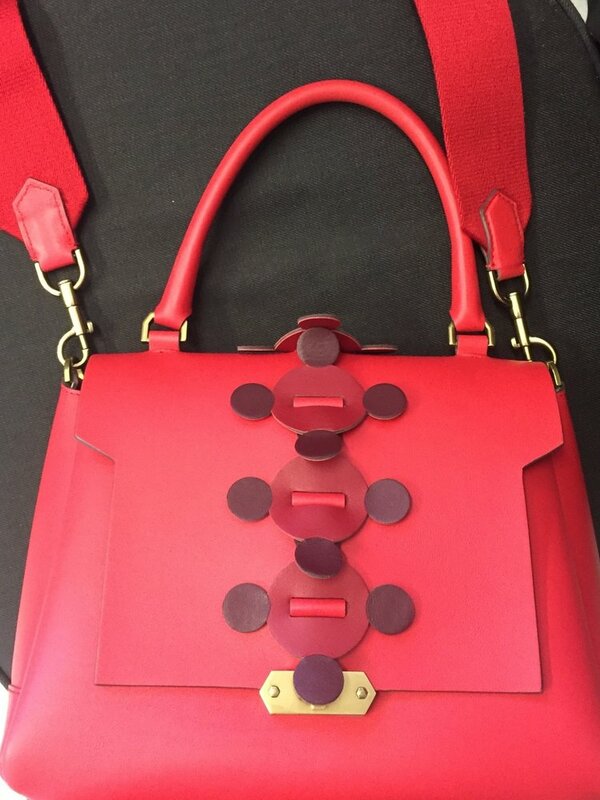 The Atelier team worked hard on the detail to revive & re-colour this bag. This suitcase was the ultimate embodiment of a piece with history and most likely one with many stories. Constructed in stainless steel, the case arrived bent and unable to fully close, our team fixed it up whilst keeping its vintage look. When we can’t find a solution, we make our own. When this Mulberry Jacket was missing one of its unique floral clasps, our Atelier Team created and replaced a leather piece in line with the original design. 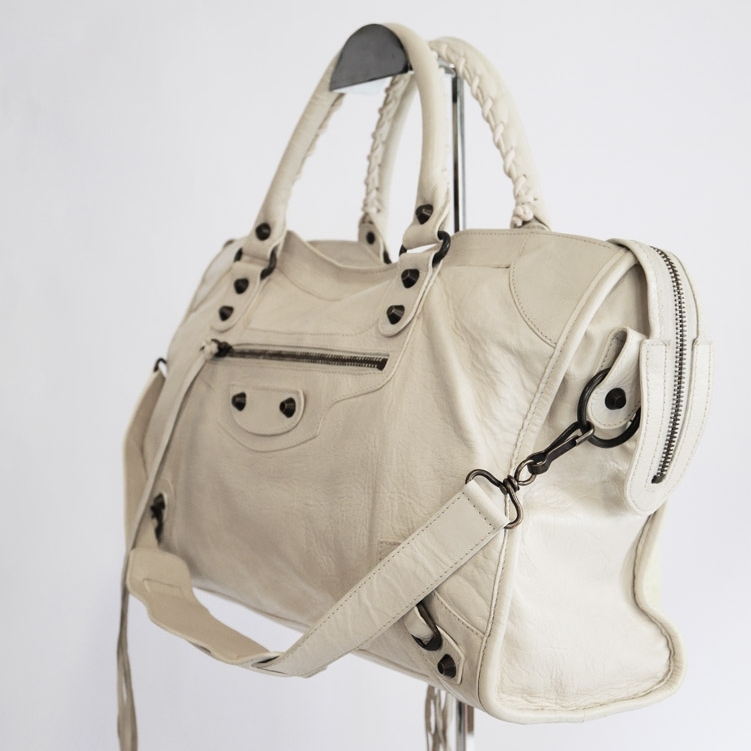 Restoring Balenciaga’s City Edition Motorcycle bag. 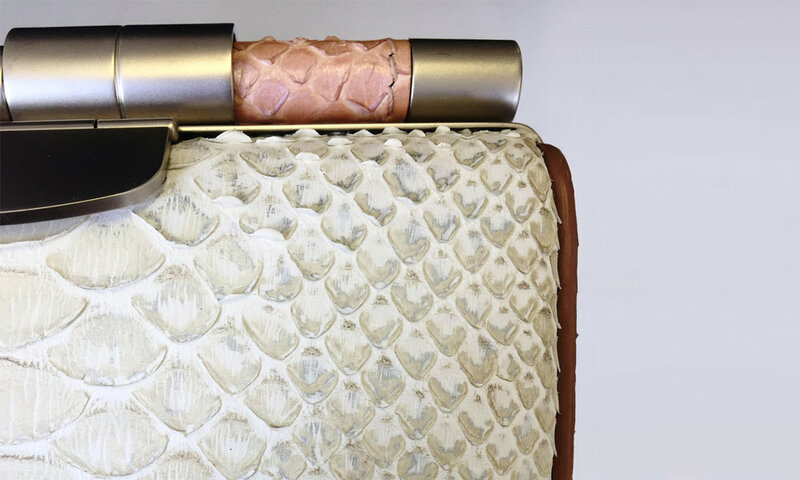 Restoring the 'Jamie' python clutch by American designer Tyler Ellis. This Evy clutch from the iconic Salvatore Ferragamo, required special attention to repair loose chains and source perfectly matched replacements. As designers become evermore creative, so do our skills and techniques. Here we look at 3 innovative techniques to revive, repair & reimagine these shoes. 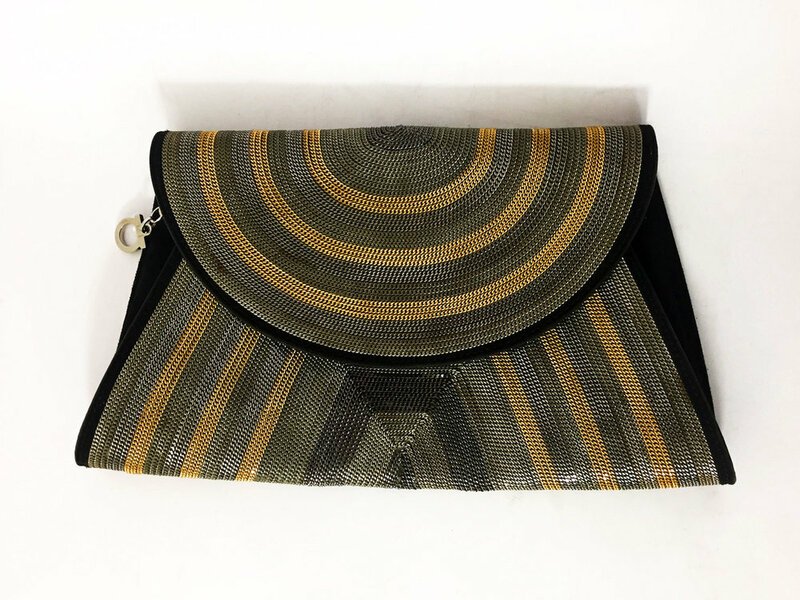 This vintage, black, semi-patent exotic skin handbag from a Miami vintage shop was in great condition but the handle had dried and cracked. Since the fashionable press hailed white as the fresh alternative to black, the rise in sales of the covetable white trainer soared. Tod's shoes are made with high-quality leathers, loafers and moccasins are expertly crafted in super-soft materials in a range of rich muted hues. Based on a driving shoe, the first Tod’s product was a hand-made casual loafer in the softest Italian leather and indeed made with the finest Italian craftsmanship. Chairman Diego Della Valle says of loafers “Before, shoes were very stiff, without any comfort, and we tried to change that completely. We tried to consider shoes like a pair of gloves. We think all the time about light, soft, comfortable, useful - something you can wear all day.” So it’s no surprise they are so popular. Our creative team regularly receive loafers from a variety of brands that are often well worn. This particular pair of brown loafers had several scratches and signs of discolouration, especially at the front of the shoes. Firstly, the shoes went through a cleaning process which involved a special leather foam to remove all the dirt so the team could see the damage in full on the surface of the shoe. To get the perfect colour match and to keep the natural tones in the leather, the team decided to use a special technique with wax and dye. When applied to the leather, this combination of mixtures regenerates the fibres, revives the colour and darkens the parts with discolouration. As always, the colour is hand mixed in our atelier and the team always consult with the original colour of the shoes. Before applying the mixture on the shoes, the colour was tested on a small part of the shoe to ensure that we achieved the perfect colour match. The colour was then applied to the shoes with sponges that are gentle on the leather and they also help to create a uniform finish. Once the colour had been applied to one of the shoes, it took around 15 minutes for the leather to absorb all the colour. To check the result, the shoes are buffed with a fine cotton cloth to confirm that the shoes have properly absorbed the colour. This process was repeated three times until the colour was uniform and vibrant again. The final step consisted of applying a protective wax to the shoes and they went through one last polish to really bring them back to life. We have a number of techniques to colour restore your leather items so please get in touch if you have anything that is in need of any kind of repair or restoration. If you can’t see the service you need on the website the team are more than happy to advise and guide you on possibilities to restore, rather than throw away, your items. Christian Louboutin, born in France in 1963 with rebellion in his bones, was expelled from school at the age of 16. He then decided to learn the ropes of the shoe industry and ended up working with Charles Jourdan in the 80s and was mentored by Roger Vivier. He created his own line of women’s shoes in the early 90s adding the flirtatious red soles were in 1993 which are now the symbol of the highly sought after luxury label. Most Louboutin stilettos have unique combinations of materials and textures which is a testament to the high attention to detail in both the design and the craftsmanship of the shoes, which is exactly what we love to see in the atelier. We received a pair of the iconic ‘Follies’ heels that shimmered from every angle with crystal embellishments and they were finished, of course, with the unmistakable red sole. When they entered the atelier, the glittered heels were damaged and the heel tips were missing. The damage on the heels was so severe we were unable to restore it, so instead we needed to replace it. As the leather covering the heels was a unique leather developed by the brand, our approach was the remake this in order to replace it. In addition to the heel damage, the sheer mesh of the upper had some crystals missing that needed to be re-set. Our artisan analysed the technique implemented in the creation of the original material and determined that the glittery leather needed to be developed on a suede base. So, we sourced a soft beige goat suede and three shades of ultra-fine glitter to layer as the top coat. A combination of metallic powders were tested and mixed to create the perfect colour combination and the colours needed were a blend of white glitter, light gold and silver. An adhesive was spread on the leather to ensure the glitter would adhere thinly and evenly, and it was then was sprinkled on top. This then needed time to dry before the process was repeated a second time and then it was left to cure for a week. The shoes then went straight to our shoe specialist in order to remove the heels, the old leather and fit the new leather as if they hadn’t been touched. 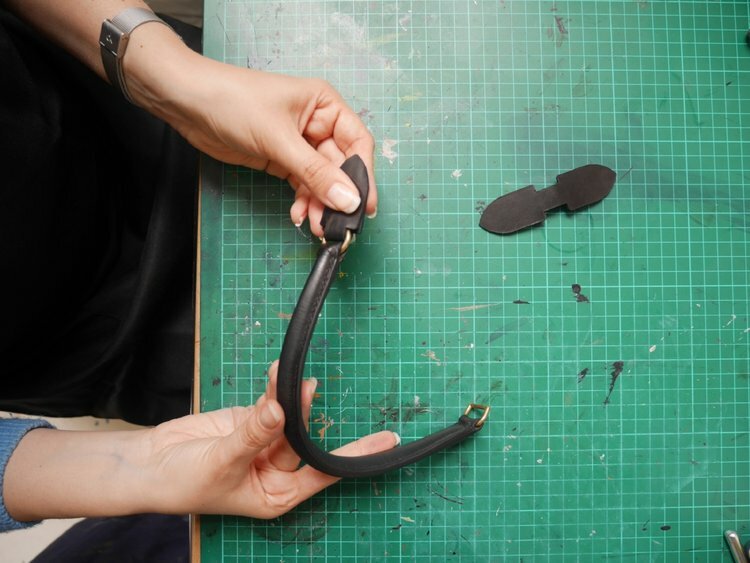 The first step was to unglue the emblematic Louboutin red sole from the back of the heel. The next step involved ungluing the insole in order to remove the nails joining the heel to the sole and taking it apart. Following that, the old leather was unglued using a heat gun that activated the old glue making it easier to pull off. The pattern for the leather piece that would recover the heel was traced and cut. Neoprene glue was applied both on the plastic body of the heel and the back of the new leather and it was glued together. Our shoe specialist needed to stretch the leather towards the outside to make sure there were no wrinkles and bubbles on the heel which was then glued and carefully trimmed. The heels were finally re attached with new nails, the inner sole was glued down and so was the red sole covering the back of the heel. The final step of the process was to hammer in new heel tips in order to make the stilettos fully functional again. 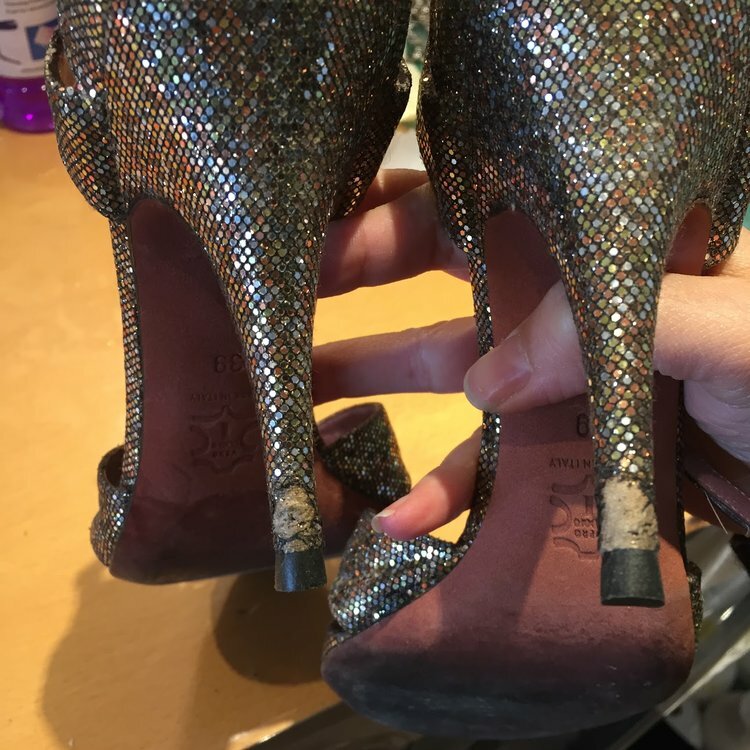 The sparkling shoes went back to the restoration department for the finishing touches; a final protective top coat was sprayed in order to secure the glitter powder and make it durable. We sourced a perfect match of the crystal studs that scatter the upper mesh, paying attention to size, colour and the faceted cut of the gems and replaced the ones missing. They were finished after a final polish and returned glistening and ready for the red carpet. If you find any of your items are missing embellishments our team of artisans are experts at sourcing a closest possible match to the original to replace them for you. We have a variety of leathers we can use to replace the leather on your heels if they get tear or get caught in grates, it happens to the best of us! You can request a preliminary quote via our online form and the team can assist you with all your needs. Jaeger, founded in 1884, is a British heritage brand and best known for its high-quality natural fibres. Founders Tomalin, Sankey and Ihlee embraced the theory behind Dr Gustav Jager’s book of using animal hair in clothing and began producing woollen garments. The brand saw Ernest Shackleton choose Jaeger to clothe him for his expeditions from 1907 to 1909 and when they began using woven camel hair as a fibre for clothing, the camel coat is an icon of the brand, even today. 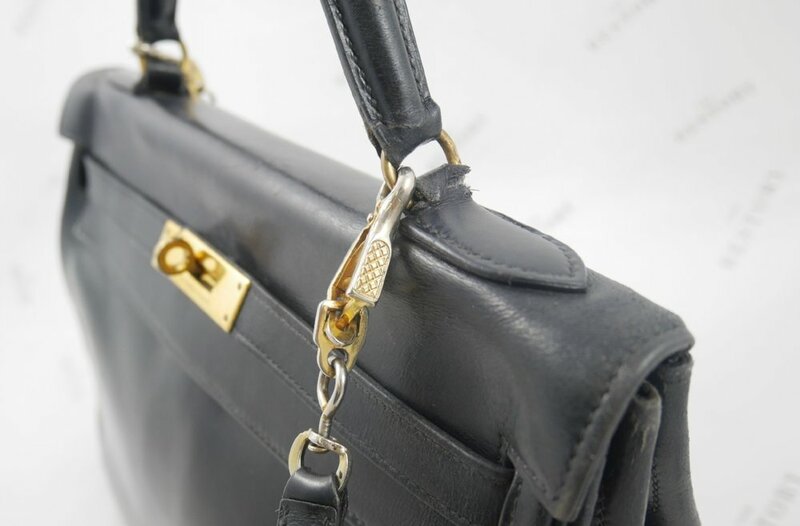 The brand has since expanded for all our wardrobe needs, including timeless leather goods, which is how we got our hands on this Doctor’s bag that was in need of a little TLC. This well loved bag arrived in the atelier with the leather looking dull and tired with a number of scuffs along the bottom edge. The side gussets, traditional of the doctor’s bag, naturally slouch and add to the character of the bag. The base was made from faux croc and although acted as a sturdy support for the weight of the bag and its contents, the corners had been so worn down the piping was exposed. This particular piping was filled with fabric cord, in some cases it is plastic which can snap and break through the leather, but in this instance we just used special fillers applied in thin layers to recreate the original shape to restore the corners. Not only was the piping exposed but there was also a small hole in the body of the bag. In order to repair this, our artisan opened the lining at the corner where the hole was and used a small piece of skived leather to reinforce and conceal the hole which would protect the hole from further damage. This was then sanded and smoothed to blend in and the lining was stitched back with a blind hand stitch, as if it hadn’t been touched. Before the colour restoration could start, the bag needed to be cleaned and deglazed to remove excess dirt and the original protective finishing layer. This is to ensure the fresh layers of paint can adhere to the leather better and more evenly. To finish, our artisan matched the two different finishers to the original; one for the plain leather and another shinier finish for the croc. 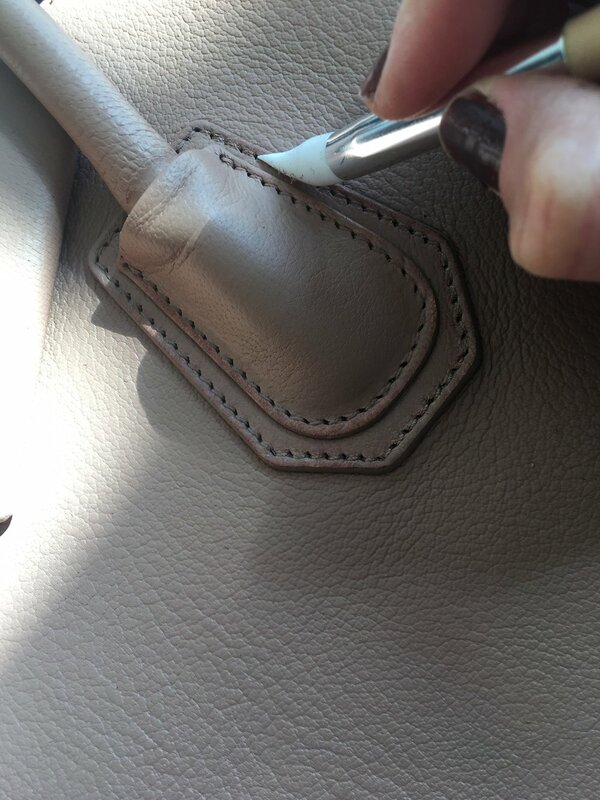 If you find the piping on your bag or purse is exposed or there are holes starting to form we have a number of techniques to repair and restore them. Just book a collection anywhere in the world through our online booking system or drop in-store at Harvey Nichols Knightsbridge. If you’d like a preliminary quote before sending it in, please just take some photographs and fill in our online form where our team will assess and come back to you. Egyptian-born Gaby Aghion pioneered the idea of prêt-à-porter fashion and became founder of beloved Parisian label Chloé. She showed her first collection at breakfast in the Café de Flore on the Boulevard Saint Germain in 1956 with a vision to give women the freedom to dare to be themselves. Now lead by Natacha Ramsay-Levi who is “very proud to be part of a house founded by a woman to dress women” the label is best know for its handbags and ethereal floral dresses that are both daring and feminine whilst oozing effortless Parisian chic. This Chloé Marcie bag, crafted from textured leather with equestrian style stitching and gold-tone hardware, came into the atelier with one of the leather zip pulls detached and the other missing completely. Our solution was to make a new tassel from scratch using the other for reference to ensure it was a perfect match and reattach them. We started by measuring the dimensions of the existing tassel, giving us the length, width, and thickness we needed to create a new one so it would be an exact match. Then from this, we made a paper template as a pattern to work from. The original tassel had a leather surface on both front and back, so the new one needed to be made from two pieces of leather glued together. We put reinforcements in between the leather layers to ensure the longevity of our replacement tassel. After sourcing a matching leather to the original, we skived it to a thickness that when layered with the reinforcement would match to thickness of the original tassel. Then we cut out the tassel pattern using the paper template. The next step was to recreate the decoration at the end of the tassel by making a pattern . We made a pattern and cut it out of a matching leather. After edge coating both pieces, we glued the decoration onto the piece. We then sourced a matching rivet and attached that to the tassel using a specific machine. The final step was to simply re-attach the tassels to a metal ring and then to their respective zip pulls and the bag was returned almost as good as new. In our atelier we have a number of capabilities to restore, repair or replace any hardware or embellishments that have gone astray ensuring it’s a closest possible match to how it was original crafted. If you have an item that needs restoration or additional hardware just book a collection anywhere in the world through our online booking system or drop in-store at Harvey Nichols Knightsbridge. If you’d like a preliminary quote before sending it in, please just take some photographs and fill in our online form where our team will assess and come back to you. Salvatore Ferragamo, once known as the ‘shoe maker to the stars’ has been an iconic household name in the luxury fashion industry since the 1930s. Best known for his beautiful shoes, his legacy still thrives with many investing in his pieces that ooze the finest Italian craftsmanship. The Ferragamo Museo opened in 1995 and showcases thousands of his shoes at his home in Florence. Since Salvatore’s passing in 1960, the brand is lead by the Ferragamo family who continue to nurture what he created and its Italian roots remain strong. 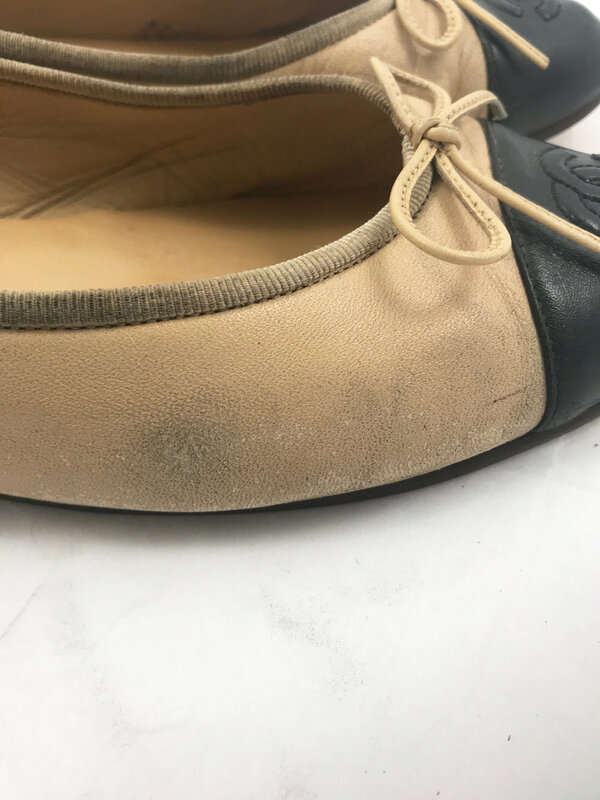 We recently had the pleasure of restoring a pair of leopard print pony skin ballet pumps with the iconic Ferragamo bow on the front that, due to regular use, had shed over time and were left with balding spots. Contrary to popular belief pony hair leather is usually created from cow or goat hide. The pelt is shaved to replicate the hide of a horse and is then bleached and dyed into popular patterns such as leopard or zebra print. 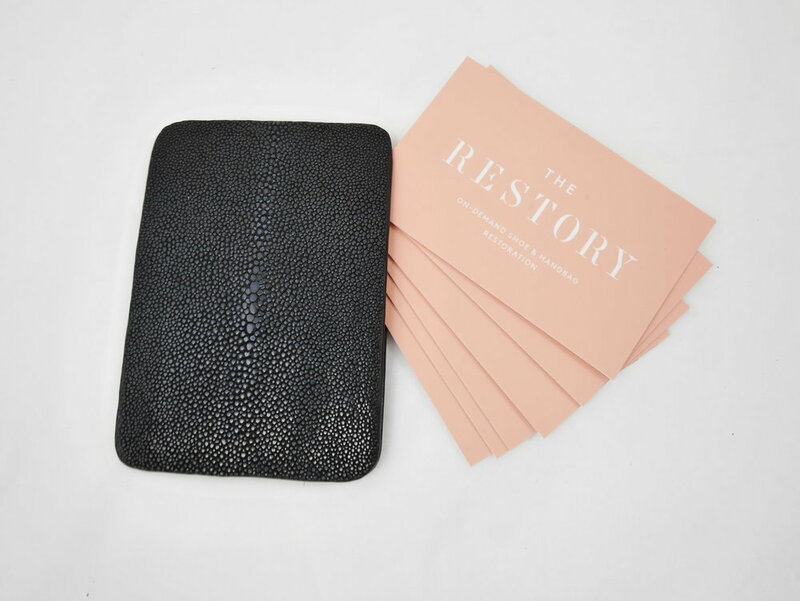 Here at The Restory, we often receive well-loved items made with pony skin in the hope that we can restore the balding of the hair. Our atelier team use a specialist technique to recreate the texture of the pony skin without using any hair at all. 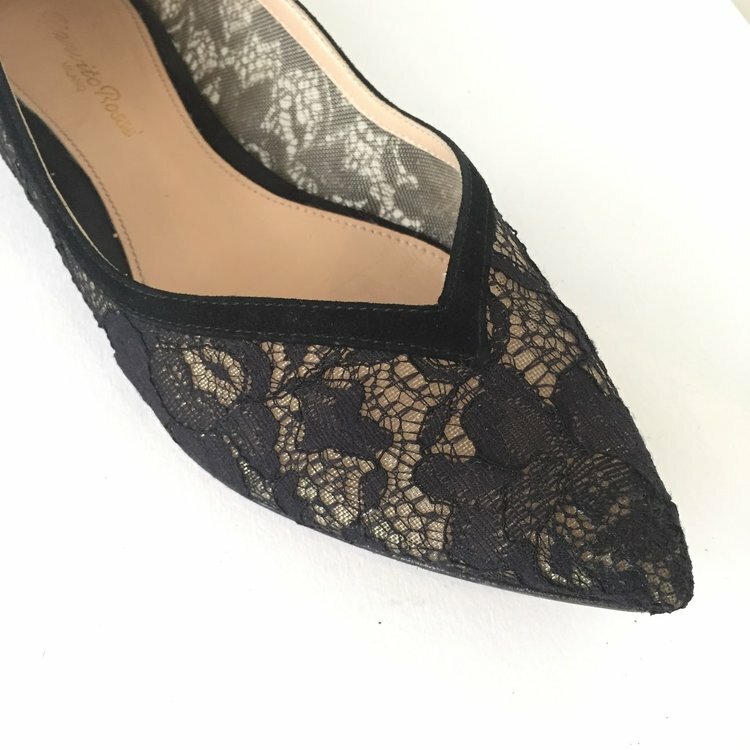 When we received these beautiful Ferragamo pumps into the atelier, the hair had shed so much there were noticeable bald patches on the toes, heels and lower sides of the shoes. We needed to repair the shoes with a technique that would be hard wearing and still blend in with the texture of the pony skin hair. The team decided to use a painting technique that involves mixing multiple shades of brown to mimic the tones of the hair; this would also create depth and a more realistic surface. Using a tiny paintbrush, the paint was applied to the bald surfaces in soft hair like strokes paying close attention to the existing pony skin so there was still a consistency in the pattern. This technique creates an illusion of pony hair and blends in easily with the rest of the hair. As the paint is applied slowly, our artisan could better control how many layers to add depending on how severe the balding was. Once all the patches were recovered, a finisher was applied that created a protective seal over the paint. The client was incredibly happy with the result. The restoration provided will be more hardwearing than the original pony skin. We are always working to create new techniques to ensure that we are able to restore even the most seemingly impossible problems. If you don’t see a service listed that you need, please do get in touch with our team and we can review your item through our preliminary quote request form online. 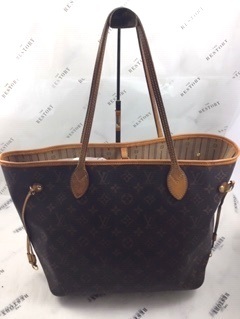 Louis Vuitton’s most coveted bag, The Neverfull, was created in 2007 and as the name suggests, is the tote bag to fit everything you need in, and a little bit more. The classic structure of the tote and over the shoulder handles mean it’s perfect to throw on over any outfit and is both practical and chic at the same time. The most popular version of the bag is the ubiquitous Monogram print which was introduced in 1896 or it can be found in the timeless checkerboard Damier Azur and Damier Ebène coated canvas prints. The popularity of the classic Neverfull has lead to limited editions artist collaborations such as Stephen Sprouse’s graffiti print and, a favourite at The Restory, Yayoi Kusama and her psychedelic spots. Of course the tote bag to fit all our everyday needs is sure to be filled, and overfilled, which over time can lead to the handles stretching, wearing thin and at worse tearing. Before it gets too late, we encourage you to send your bag in for repair like this client who’s Neverfull was in need of a little TLC. This particular Neverfull tote bag had been worn so much that the binding at the top was falling apart. Our approach was simple, to replace the leather binding with new ensuring the Louis Vuitton style remained. The first step was to remove the old binding by unpicking the thread, making sure the body of the bag stayed in tact. Then, we needed to source the new leather. The trims on Neverfull bags are made with Vegetable tanned leather which means the leather comes in a natural colour when you first buy it. With time the leather ages naturally, creating a patina and darkening its colour. We wanted to use a new piece of the same quality of leather and to avoid the colour difference we used a special technique with wax and dye to darken it. We hand mixed the colour, keeping in mind the shade of the previous leather piece, and applied it to the leather. Once we’d achieved the perfect colour match, we thinned the leather so the binding could be folded over the edge of the bag. Then, we cut our leather to size and glued it to the bag, using a tool to ensure the leather is bent over the edge of the bag evenly. With the new binding on the bag, we needed to stitch it. Most Louis Vuitton bags that are made with vegetable tanned leather are stitched with a yellow thread. We sourced the correct coloured thread and kept in mind factors like stitch size in order to keep the design as close to the original design as possible. Even the most durable bags will start to wear down with use, especially the most practical ones that are worn regularly. We recommend sending them in sooner rather than later, a clean and condition will massively help with the wear of leather. Alternatively if like this one areas need to be replaced, we remake trims, handles, tabs which will extend the life of the item. Book a collection to anywhere in the world through our online booking system or drop in-store at Harvey Nichols Knightsbridge. If you’d like a preliminary quote before sending it in, please just take some photographs and fill in our online form where our team will assess and come back to you. It doesn’t matter if your pair of boots are the tough and keep your feet warm and dry, they can still build up dirt and mud. The traditional Timberland boots are incredibly reinforced, lined with insulation material and leather with a waterproof sole, silicon treated nubuck and sealed top. However when walking through snow, mud or grit it will show the signs. The Timberland brand began in 1973, its always had a focus on footwear for outdoor use, its huge popularity came from the fact that they were waterproof. After coming back from a winter trip, our client brought these Timberland boots in for a special clean. There was a lot of mud dried up all around the boot and sole, plus sweat/salt marks. We analysed the best approach for those specific boots, taking into consideration the leather durability, the sole material and the type of dirt, so we can use the ideal technique. As this leather is treated with silicon, most of the dirt was superficial, but some of it did get in a bit deeper. We started by removing the dry mud with a dry cleaning method to eliminate all the excess dirt. The shoe laces are removed and cleaned separately, soaked and scrubbed depending on the material and damage, in some cases we may chose to replace these. Then we moved on to a semi wet method to remove the mud particles that had penetrated into the leather and also to remove the water marks from the nubuck. This method massages and conditions the leather deeply, reviving the nap and the colour. In order to get the best texture of the nap, we brush it softly while its still damp, so that the nap dries in the right position. Sometimes your items just need a special clean. Our team assess everything in house and will advise you on the services that your shoes, bags or leather goods many need. If you’d like to have a preliminary quote before sending them in, please feel free to follow this link to the form on website where you just fill in the description and attach pictures and a member of our team will come back to you. Alternatively drop off at Harvey Nichols Knightsbridge or book a collection today for a special clean which takes 5-7 working days. Born in the 70s in East London with training on Savile Row from the age of 16, Alexander McQueen certainly left his mark on the fashion world. McQueen’s experience working for two different British tailors allowed him to develop his skills and knowledge of the technical construction of clothing. Further experience with an array of designers and the opportunity to work in Milan led to McQueen gaining a Master’s from Central Saint Martins, he then quickly became one of the most respected fashion designers in the world, picking up a number of critically acclaimed awards along the way. The McQueen legacy lives on now led by Sarah Burton who continuously delivers impeccable craftsmanship using exquisite materials and high attention to detail. Of the many embellishments that Alexander McQueen’s collections are characterised by, floral appliqués are one of the brand’s most beloved when it comes to footwear. We had the pleasure of restoring a pair of Mary-Janes and we are going to tell you a little more about their unique journey through our atelier. A client sent her red suede Alexander McQueen heels which were undamaged, apart from one flower pom-pom on the left shoe was missing and the other one was unattached. The approach taken by the atelier was simple; to find the exact same material as the original and rebuild the pompom from scratch. After an initial clean, the first step was to analyse the construction of the floral embellishment in order to reproduce it. The flower was built by layering and folding the same pattern 10 times. So, we proceeded to copy and draw the four-petal pattern and cut it in cardboard, carefully marking the stitching holes in the centre. This one would be used as a cutting guide. In the meantime, the atelier sourced a goat suede from an Italian tannery to perfectly match the same shade of red as the shoes. As previously mentioned, this flower was made up of 10 layers of the same pattern. We used the cardboard pattern as a guide to hand cut the suede with a scalpel, marking the stitching holes with an awl needed to centre the pieces correctly. Using a sharp blade was essential to ensure the edges were neatly cut around the leather. We attached the petals of the soon-to-be flower pom-pom using a clear nylon thin thread, following carefully the structure; three flat layers at the bottom, followed by seven layers at the top folded in half twice and positioned concentrically. The final step to make the pom-pom blossom was to open up the folded pieces by hand, in order to avoid a compressed appearance. 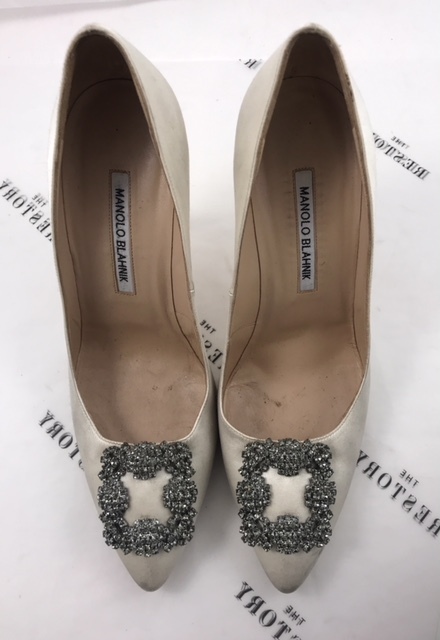 If you’re shoes are missing studs, appliqués or hardware please get in touch and we’ll source a replacement or create a bespoke piece. If you’d like to see another Case Study with a bespoke replacement created see our feature on the Mulberry Jacket. The Louis Vuitton Cannes beauty case, seen here in Castilian Red, was first designed in 1994. This design has since been discontinued, making it even more of a desirable piece to have for your own. It has been created using luxurious Epi leather and its box construction includes stamped monogram leather with Alcantara lining. With such a beautiful and coveted piece we felt we needed to capture and show the journey of the restoration. The case itself arrived to the studio in superb condition, it’s fault being that one side of the top handle was broken and had completely detached from the fitting. After careful inspection, the atelier team discovered that the outside leather had been torn and the reinforcement broken. The solution was to completely rebuild a new handle to guarantee the bag’s durability. In order to create an identical handle to the original, our atelier needed to unstitch the previous handle and remove the interior inlay that gives the handle it’s unique shape. The inlay for this bag was in still in impeccable condition, which meant it could be reused in the new handle. 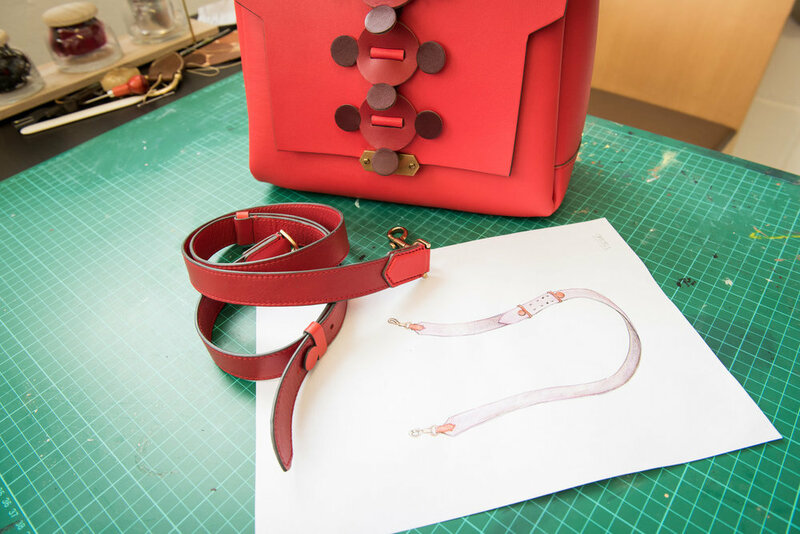 The atelier were able to source a perfect colour and leather match to the original. For the interior, a reinforcement material made from recycled leather was used to give support to the handle and improve its longevity. A set of patterns was created following the measurements of the original piece so that the handle could start being cut and then assembled accordingly. Due to the Cannes bag having a reinforced lid, it was best to manually stitch the handle after attaching it to the bag as oppose to removing the whole inside structure. For the final touches, using a saddle stitch technique the atelier was able to create stitches that are perfectly slanted and suited to the bag’s original design which in turn are also stronger than a machine stitch. Looking for new straps for your bag? The Restory is able to provide bespoke work to your item-specific needs. We can rejuvenate a vintage piece or service your most recent purchase to prolong the life of your accessories and ensure they age gracefully. Book a collection today or use our convenient drop off location at Harvey Nichols Knightsbridge for your items. 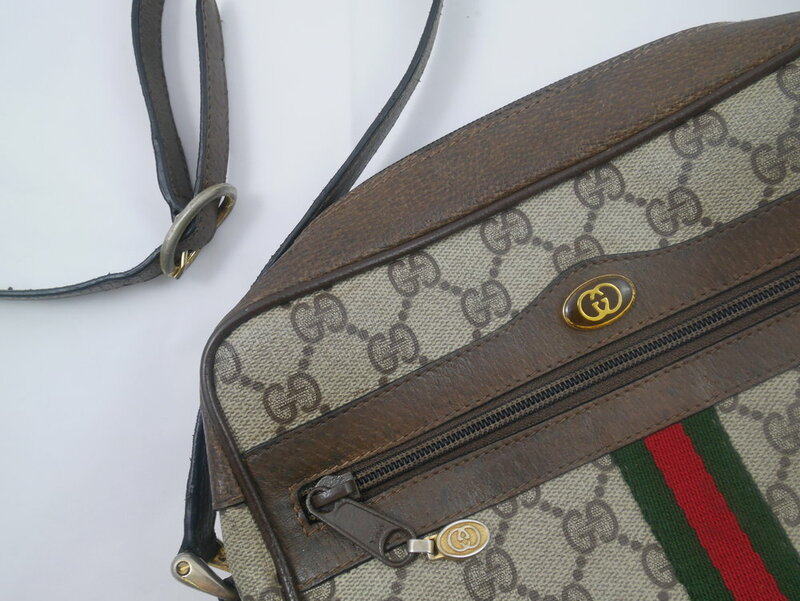 Transcending seasons, Gucci is continuously on top of the accessories game and unsurprisingly, the most varied items cross our atelier for restoration. So when we got our hands on several vintage designs it was unanimously agreed that together, these would make the ultimate Gucci case study. See how we revived some of this season’s hottest accessories below. Although the Ophidia looks like a vintage bag, it is widely available for sale through Gucci and resellers alike- vintage is the new ‘new’ after all. The GG logo stems from the 1970’s and characterised by the Gucci canvas motif paired with the instantly recognisable Web- stripe in the middle, this bag is definitely a brand classic. The small shoulder bag we received was generally in good condition but some fading had started to occur over time. Particularly the edges of the shoulder strap showed signs of wear as the leather had dried out and started to crack. Note: this can usually be prevented by regular conditioning, which will keep the leather supple and make it less susceptible to outside elements. The edges of the strap had also started to fray and in order to revive them, we had to carefully sand back the edges on either side and reapply edge paint to seal the leather. 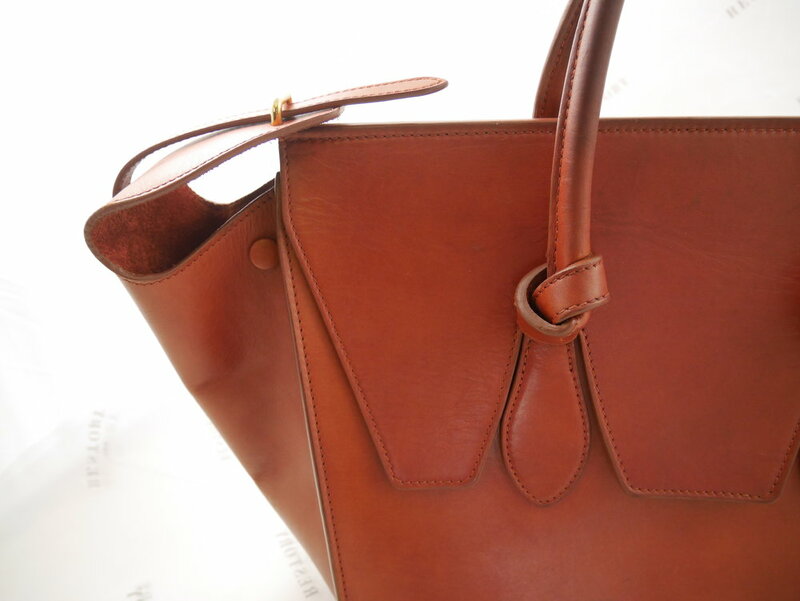 Afterwards, we used a mix of dye and cream to reinvigorate the brown leather and enhance the overall look of the bag. The zip puller had also lost some of its original lustre so we hand matched the colour of the zip and painted the metal with a material specific paint. Small leather goods like wallets tend to show the most wear and tear since they are usually kept in back pockets of trousers where a lot of friction occurs. 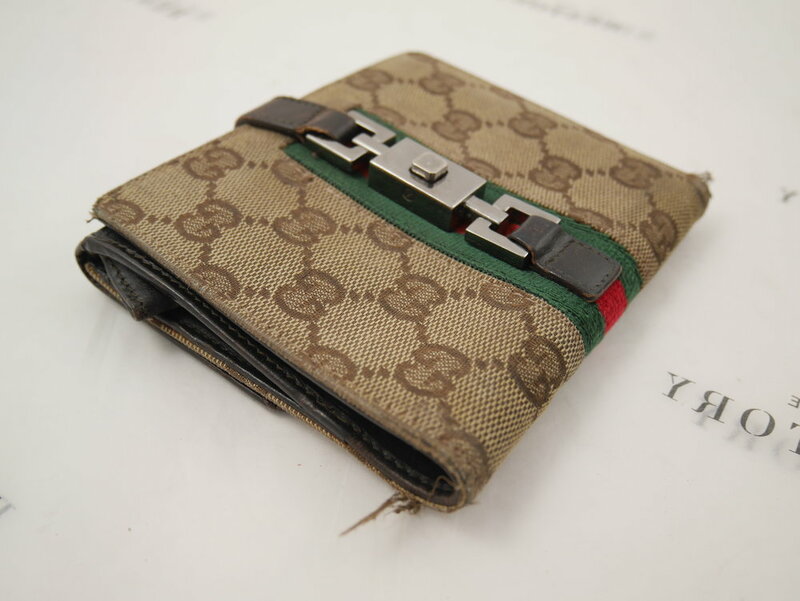 Consequently, the corners of the vintage wallet were frayed, which can eventually turn into a tear in the fabric. The loose threads had to be trimmed (with a sharp blade) and melted to create a smooth finish and stop any further fraying. Afterwards, the leather edges were reworked with a fine tool. Leather also tends to wear thin due to continuous pressure and abrasion that happens with usage so it is advisable to carry small leathers in a bag or in the front pocket of a jacket to prolong the life of a small leather good. The leather flap and pocket only required a bit of reconditioning that was carried out with a mix of dye and cream to improve its colour and texture. As a finishing touch, the hardware was cleaned and polished to remove the tarnish that is common on most vintage items. The original handles of this vintage suitcase were completely destroyed and too far gone in order to salvage them in any way. Since luggage handles need to have the strength to carry the load, the only option left was to create new handles. First, we sourced durable leather and our colour specialist hand matched the colour to the original handles of the Gucci suitcase. Again, a mix of cream and dye was applied to nourish the leather whilst colouring. Once the correct tone was achieved, we also used the original handles to create a new pattern. The leather was cut up and stitched onto the original D-rings of the suitcase. Lastly, the raw edge of the new handles was sealed and coloured so the leather would blend in and appear smooth to the touch. Additionally, the piping around the corners of the luggage was missing pieces of the original leather so these had to be filled, covered and re-coloured. The body showed some surface stains that required direct attention and spot treatment, whereas the rest of the leather on the suitcase was mostly faded, dried out and calling out for some nourishment. We were able to colour this by using the exact same dye as for the handles. Especially vintage leathers require more than one application to fully ‘feed’ the leather and restore some of the natural oils that are present in leather. The below after picture of the suitcase shows how the reinvigorated leather looks shiny and lustrous instead of the dull and brittle state it originally arrived in at our atelier. Another part that required attention was the Gucci Web stripe as it seemed stripped bare on certain parts due to excessive scuffing and years of usage. Although it’s fairly impossible to refill the holes and spots that were left behind, we used a light coat of paint to bring some of the vibrancy back to the red stripe and made sure the colour was set with the heat of an iron. Whether your accessory is vintage and loved or this seasons latest purchase, The Restory is able to tailor aftercare to item specific needs. You can revive an old classic or service your new Gucci shoes and bag to prolong the life of any product and make sure it ages beautifully. Book a collection below or use our convenient drop-off location at the Harvey Nichols Knightsbridge store. Even bags made out of the highest quality leathers are susceptible to some wear and tear over time. 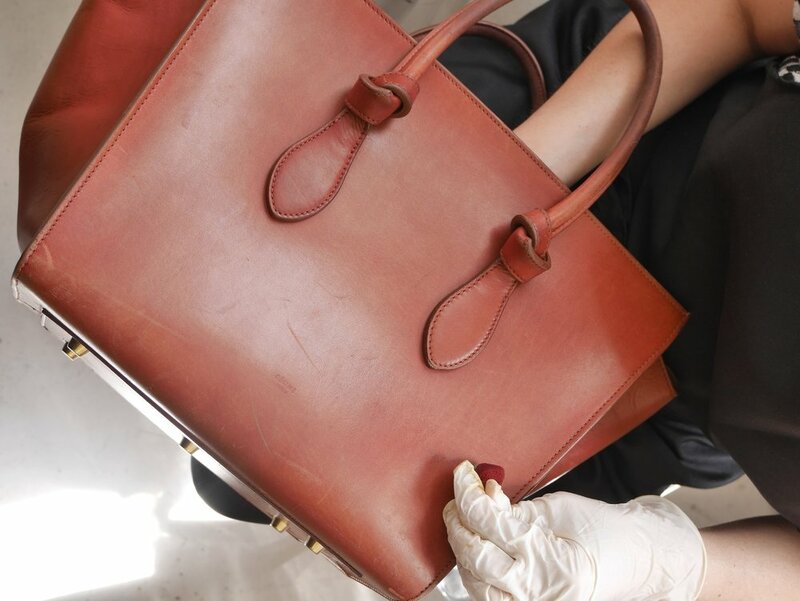 This was also the case with the beautiful vintage Hermès Kelly we recently received and restored at our atelier. 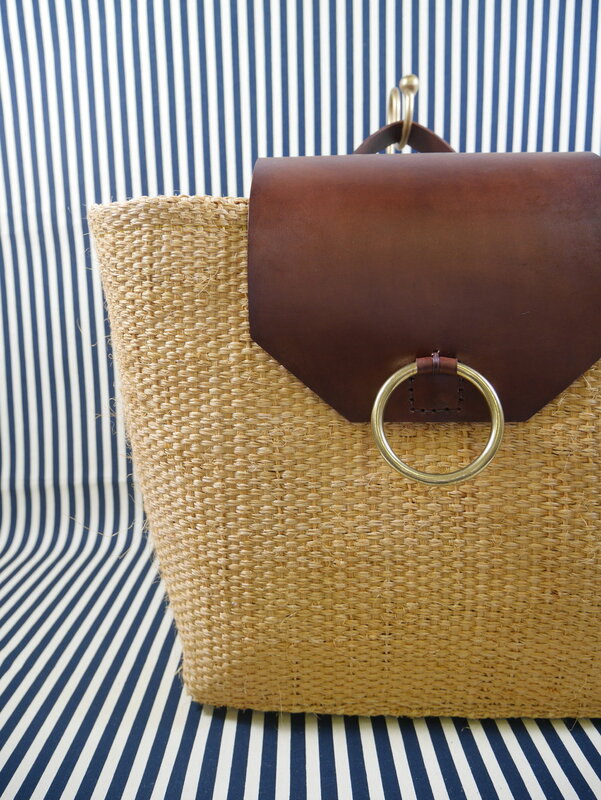 Passed down from the client's grandmother, the bag was a heirloom piece that had withstood decades. It just needed a bit of The Restory magic to be brought back to its former glory. Curious how the Hermès Kelly earned the status of one of the most beautiful and coveted bags in history? Follow the amazing journey of this iconic bag on our journal here. Due to the age of the Kelly, the leather had become dull and faded at some areas of the bag. A few scratches were also present on the surface and the bag corners were in need of a good touch up. More prominently, both handle tabs were at a dangerous breaking point. Generally, the first step is to prep the leather for restoration before any actual work can begin. And after initial assessment, the Kelly was thoroughly cleaned to remove any dirt residue, dust and oils from the surface of the leather that would naturally have built up over the years. The bag was then coloured black with a unique set of dyes and a mix of conditioning cream to achieve a deep black tone that would bring back the original glossy colour while deeply conditioning the leather. Note: leather is to be conditioned from time to time so the material is kept supple. This is an absolute essential step to prevent any leather from drying out and, in worst-case scenario, even cracking. When leather gets dry, it will loose all softness as well as its natural flexibility and there is increased chance it will become brittle and weak. One conditioning service every two to three months should be enough to keep your bag protected from surface scratches and keep the skin moisturized. 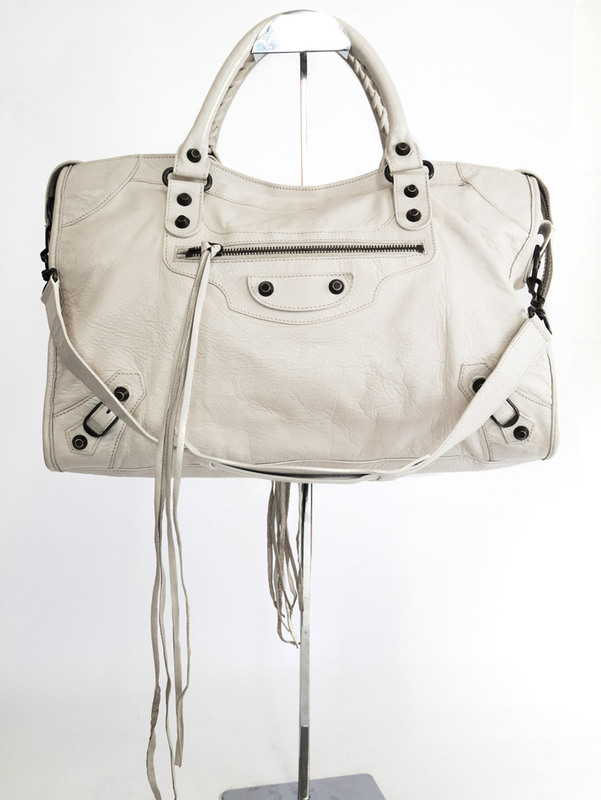 Scheduling a little extra time for a bit of TLC can really add years to the longevity of a bag. In order to replace the handle tabs, one of the most important steps in this restoration process was to source leather that was the closest match to the original. We always aim for our restoration work to look invisible and essentially to maintain the integrity of the design. Therefore, we traced the pattern of the original leather tabs to attain the correct sizing; after which the pieces were cut for the internal layering and stitched with precision, positioning each stitch by hand. Before replacing the old tabs the whole front flap of the Kelly needed to be unstitched so we could reach into the lining of the bag. Next, the leather tabs were glued atop the flap that was hand stitched into the correct position. This requires very detailed work as every single hole of the original stitch has to be matched carefully and the process takes much longer than usual as there is only 1.2mm of space between two stitches. However, it also allows for the very refined finish Hermès is so renowned for. Then we repainted the edges and finished it with a wax coating to recreate the smooth corners. Finally, another type of wax was layered on top to protect and condition the leather and achieve a beautifully dark and lustrous look. Keep the sparkle in your life and put your best foot forward with this month’s glittered Chelsea boots - you’ll be sure to leave those January blues behind! We’ve decided to keep it in the family, as the spotlight’s on our Head of Atelier, Thaís and her beloved Chelsea boots. Thaís is behind the many masterful restoration & re-imagine projects we are proud to have worked on so it made a refreshing change for her to work her magic on a pair of shoes that she can actually enjoy herself! However, this case study was the outcome of a little accident at our atelier – black dye was spilt on Thaís’s burgundy Chelsea boots, quickly soaking into the leather, leaving an irremovable stain. An accident that really turned out to be a blessing in disguise. Since then the boots were put to one side until one day, inspiration struck and glitter was the answer! We’re seeing the glitter trend across all footwear from fancy going-out styles to casual everyday trainers. So glitter was a great way to have some fun and bring Thais’s boots back to life. The dye that was spilt on the boots was black, so the first step was to dye the rest of the leather black, to create an even colour, like nothing ever happened. This is a full re-colour, so technically the process could have stopped there but what’s the fun in that? Since Thaís still wanted to wear the boots as an everyday shoe, her final design featured a glitter finish on the front of the boots only, leaving the backside as plain black leather. She felt this would keep them as an easy to wear style, but with an interesting touch. In order to create a good texture and depth for the glitter front, two types of glitter were selected, one with a fine powder- like finish and another with a more thick visible shine that would catch glimpses of light reflection. The black glitter was applied in thin coats and thus required several layers. It was mixed with a leather paint composition to ensure the glitter would keep maximum sparkle power at all times! We wouldn’t want to loose anything to the floor so at last a finishing paint was applied to seal the joy. After a quick conditioning treatment with a specialist wax for the back of the Chelsea boot, it was time to stand back and admire our in house re-imagine project. 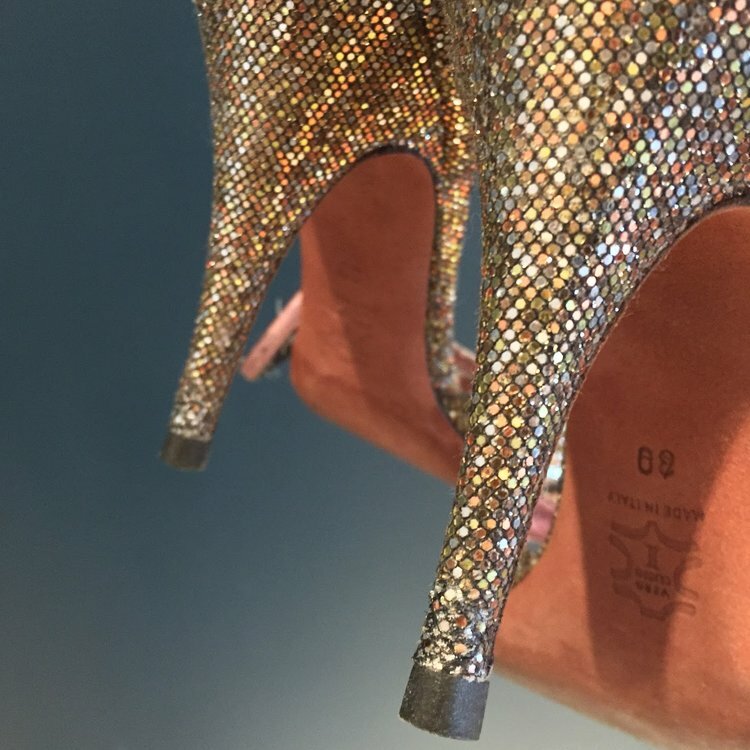 Now it’s official: you name it, we glitter it. Our Head of Atelier is so taken with the new-look of her boots, she’s on the hunt for more glittering projects – now’s the time to book your collection. What else would you like to see doused in glitter? If you have any ideas you'd like to explore with our atelier team please just get in touch and we’ll help you on your way. Our cute fur ball pets have an innate appreciation for us but maybe not our cherished material goods. Our client bought us her brand new and freshly chewed Saint Laurent shoulder bag that her adorable puppy had managed to devour in a far shorter time than she’d had to enjoy it. She had owned this iconic bag less than a few weeks and was enjoying that glowing feeling you get from a new purchase, that we all know too well, before the puppy crime was committed. On arrival we could see the state of the bag was rather dismal. The Restory’s aim is to offer the best quality repair, so when we analyse a new project we have to consider all factors. For the Saint Laurent bag there were significant structural damages on three panels: the front, the side gusset and the base. These make up the main part of the bag, making it vital to the design. Although it would be great to fully replace these panels altogether, there were multiple reasons to find an alternative path. Firstly, it would be an extensive job that would make the costs rocket sky-high; and secondly, we could not source the exact same leather. We see this often with designer pieces; the leather has been custom created with a unique texture, especially for the brand. 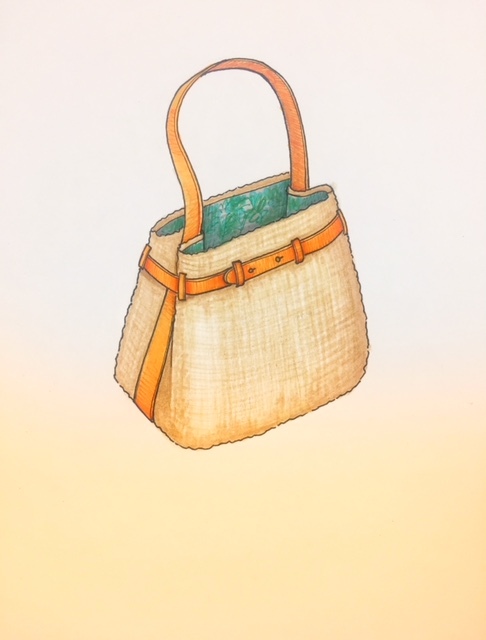 The conclusion was to re-imagine the bag with some artisanal skill from our atelier, instead of offering a mediocre match that would not do the bag justice. Masking tape has been added to the bag to give a clear idea of where the new feature will be added. The Restory provided three potential solutions to present to the client and discuss. The first suggestion was to create a panel on both sides of the bag in a style that would disguise, and partially hide, the damage and make it more discrete. The other was to make a rather clever feature of the repaired panels that would draw the eye away from the other imperfect areas and the third had more detailing and a different finish to the second design but would cover the same area. Our restoration ideas are always in keeping with our work ethic: we like to challenge ourselves to make a repair “disappear” from a piece by re-thinking a design and adding an aspect that is a well considered fit that will help to hold its value despite the wars it may have been in. The client chose the one-sided diagonal panel design with gold leather detail running between the black layers. Sourcing the gold leather from Italy meant we were able to find the perfect matching shade. 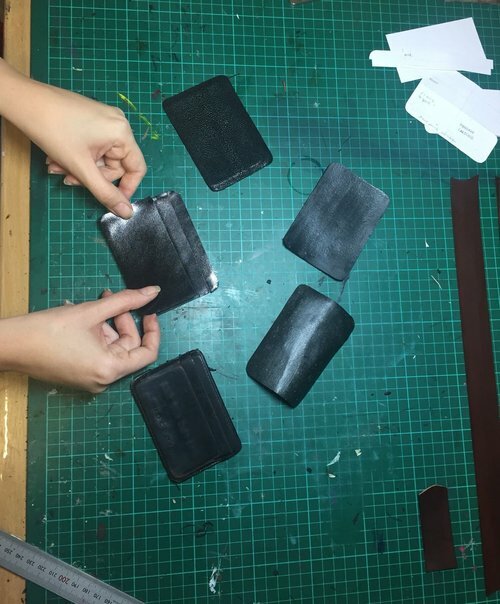 The leather was then split to reach the ideal thickness that would ensure a professional repair by removing any extra bulk that might cause the design solution to look badly executed. Even at The Restory Atelier, where we see many exquisite accessories come and go, occasionally you come across a piece that’s so beautifully constructed and special that it deserves to take centre stage. Many of our clients have a penchant for vintage and handcrafted pieces such as: men’s briefcases, suitcases and holdalls- items that are meant to last a lifetime. One of those special clients recently sent us his favourite set of a matching Fendi briefcase and suitcase for repair. Fendi has been reviving its traditional logo fabric over the past seasons and this was the perfect opportunity to take a closer look at the remake of an iconic piece. The classic monogrammed logo fabric and sturdy construction of these pieces clearly indicate they are built to last, but there comes that inevitable time when wear and tear causes the material on the corners and edges to become sensitive and start to fray. This case study gives you a closer look at the restoration process of the Fendi briefcase. Most noticeably, the leather and fabric had started to look a bit tired and was in dire need of some special cleaning and reconditioning, which is an essential step in reviving and protecting any leather piece. We started the process by applying special cleaning techniques that will not only clean but also help assess the actual damage on the item. More importantly, we also take extra care to give a mould treatment to all vintage pieces we receive as they have probably been kept in storage for a long period at some point in time. Vintage pieces tend to carry a strong smell and after the mould removal process, we like to air them out over a few days to make sure any unpleasant smells don’t linger. General wear and tear can make the hardware look tarnished over time and in this case the varnish atop the hardware had come off. We had to remove the old varnish before the hardware was brushed to give it a soft polish and achieve the look of its original finish. This is however only possible on non-coated solid brass hardware and not on plated material. After taking a closer look at the leather parts, it was clear that there was visible discolouration at the edges of the briefcase. So we decided to treat the leather with a combination of dyes and waxes to restore its colour and finish. As the Fendi logo fabric had worn off around the edges, our Head of Atelier suggested adding leather corners on all sides to prevent further damage to the briefcase. Knowing the alteration would slightly change the look of the briefcase; the remake was executed in such a way it would blend in with the original design. After measuring and marking the affected area, strips of thin vegetable tanned leather were carefully cut and dyed to match the fabric of the briefcase perfectly. Each leather strip was re-shaped to fit the case and colour matched to accommodate and complement the existing fabric and leather. As a final result this vintage gem of a briefcase was brought back to life, ready to accompany a very happy client for many years to come. The atelier team at The Restory is specialised in providing creative solutions that are tailor made to fit the requirements of the client. Curious about our bespoke services? Email your query to service@the-restory.com and our Client Services team will get in touch shortly. 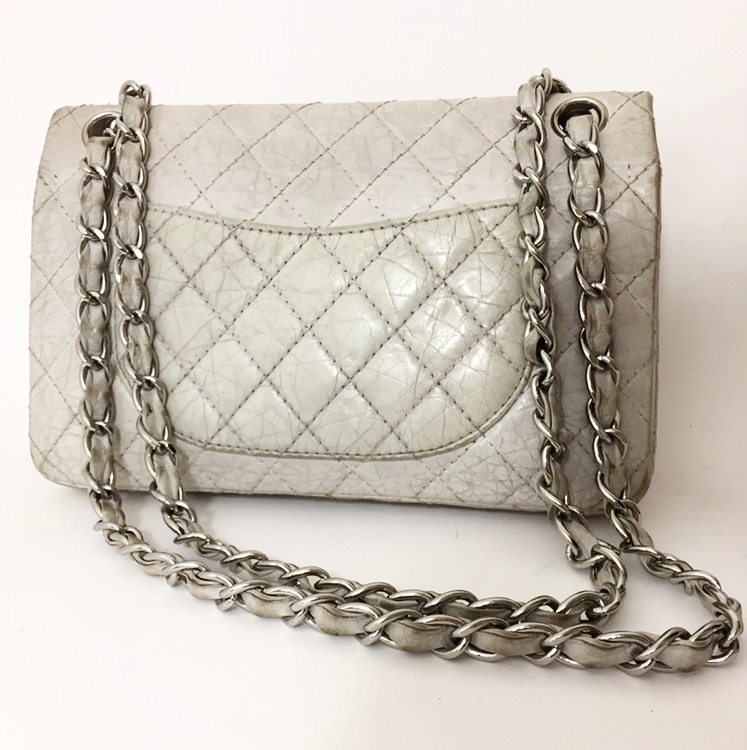 This month’s miracle makeover features the Chanel 2.55 bag mentioned in our August ‘If You Could Turn Back Time’ journal post ‘-having the power to rewrite the destiny of a Chanel Bag can be thrilling’. Chanel is timeless and has become a heritage brand, so this inherited Chanel bag deserved all the attention. It arrived well-loved with some stains, discolouration and the leather crinkled in places and so the suggestion to re-colour from white to black made perfect sense. Although it could have been restored to its original colour, the opportunity for a change was too tempting for our client. It feels like new! To properly analyse the bag’s true condition, a preparatory deep clean was required. The bag was also partially dismantled by removing the leather strips from the chains. Next the leather was stripped back with an alcohol-based solution. This prepared the surface for dying and helped to return the suppleness of the lambskin – improving its longevity. The Head of Atelier was surprised by how clean the lining came out and took the decision to keep the lining the original white colour, creating an monochrome design – perfectly in keeping with Chanel’s classic aesthetic! Tres chic! As with most things in life, the devil is in the detail so some essential steps were followed to ensure a flawless result. The smaller areas were painted first. The quilted style of the bag meant there were many stitches. Here, a lighter version of the leather paint was used so the stitching absorbed the colour. Then areas like the corners and around the zippers were double-checked to avoid even tiny white spots. The Head of Atelier, Thais, then worked on the larger areas and between the stitching, by applying three super fine coats to gently build the colour. This created a perfect black surface without compromising the touch of the leather. Our tastes are always evolving: shiny hardware teamed with supple leather currently ticks all the boxes. So we chose a semi-matte finish for the final coat over the new black colour to create a stunning visual contrast. 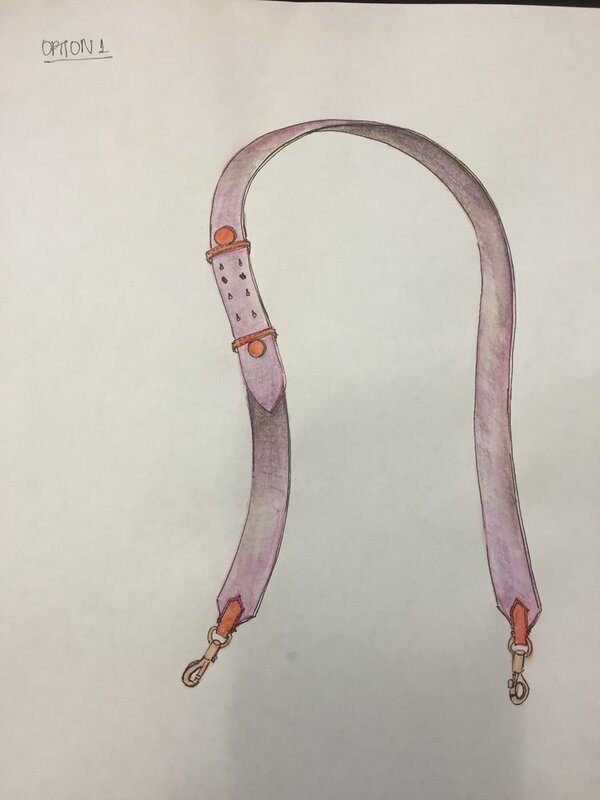 Finally, the leather removed from the strap at the beginning was re-coloured before carefully plating it through chain strap. WE CAN DO BRIGHT COLOURS TOO! Interested in re-colouring a bag or even shoes? Get in touch and book a collection today, once we receive your items we can explore all the possibilities. The choices of colours are endless and with a bit of creativity, the potential is sky-high! Our Atelier will work with you to find great solutions that suit you. Goodwood Revival has just completed its nineteenth year, a sold-out event celebrating classic car racing. It also asks guests to dress accordingly: vintage clothes and accessories, meaning some star blasts from the past are on show. There is a resurgence of vintage fever and we at The Restory have an innate appreciation for well-preserved leather goods - and those with provenance serve to indulge our desire for classics from the past even more. We simply get a buzz from knowing something’s got history! This suitcase was the ultimate embodiment of a piece with history and most likely one with many stories. It also represented a little bit of how we used to treat our prized possessions: understanding they should provide a good life of usage, in return for taking good care of them. Generally, a suitcase is robust enough to stand being knocked around during the course of its travels. Despite this case appearing to be vintage luggage, maybe even antique - it also had a few nifty contemporary features, such as plastic wheels and an extendable handle. The case might have had a small identity crisis but one thing can be certain: it was quality. Constructed in stainless steel, the case arrived bent and unable to fully close. The heavy woven canvas on the outer part of the suitcase was worn and faded, the leather hinges were torn and the leather in general was in disrepair. Leather can become dry and flaky if not regularly conditioned over a long period. Our aim is to restore and return items to their owners, looking as close to new as possible and ready for them to fall in love with again. When approaching a piece in a period style, it becomes even more important to be sympathetic in the restoration process. In this case, the client liked the worn look of the canvas body; to them, it preserved an element of history. So instead of re-dying the body, we opted for a thorough clean. First, the steel frame was restored to its former glory and the leather accents were conditioned to make the leather more malleable; ready to be glued down. Next, the leather was lightly sanded to remove the rough surface and further conditioned to restore its texture. Working with vegetable tanned leather meant we were successfully able to re-dye it with a product that both preserves and enhances the original characteristics of the leather. The leather hinges were fully replaced using the same vegetable tanned leather, and were dyed to match the original using natural tanning methods giving it a unique finish, which presents quality leather with a lifespan beyond that of chrome tanned leather. The “carry” handles of the suitcase had weakened considerably. To remedy this, they were removed and reinforced before being hand-stitched back on. Vegetable tanned leather is naturally very thick, in this case 2mm, so the holes were pre-punched before stitching. This guarantees the stitching will be positioned perfectly to achieve a handsome finish. 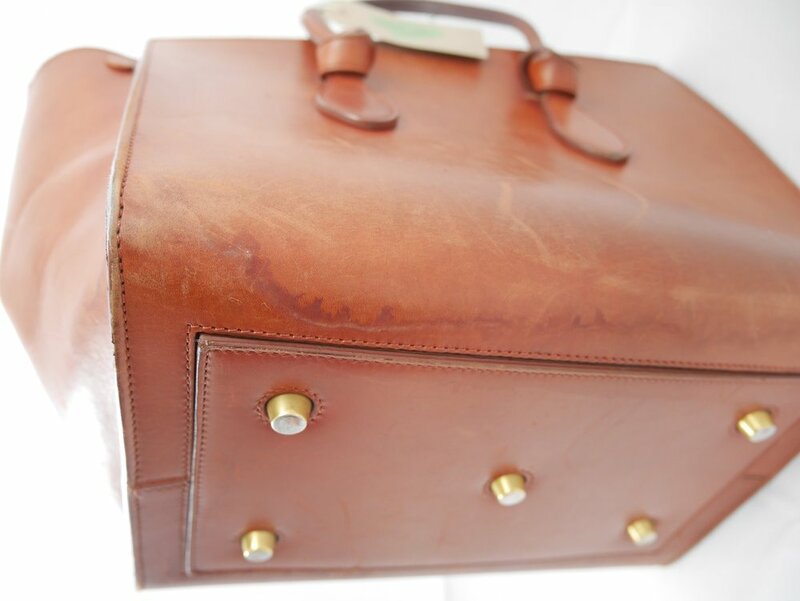 The top “pull” handle of the suitcase – which was made with molded leather around the plastic - was particularly well worn, and so the Head of the Atelier recommended leather fillers and paint to restore it. To protect the handle for the future, a second layer was added in a subtle goatskin leather and hand finished by cross-stitch – ergonomically more comfortable for the client to use, as well as stronger. The last task was to replace the hardware on the base of the suitcase with brass feet (in keeping with the original design). The result was an accurately restored piece of luggage, which retains its true and original character. The Restory works on a bespoke service. If you have an vintage item that needs restoring, drop a line to service@the-restory.com. Upkeep really depends on the material of the item, check out our blog "A Lesson In Leather" to get a better understanding. So you thought it was all shoes and bags and bags and shoes? 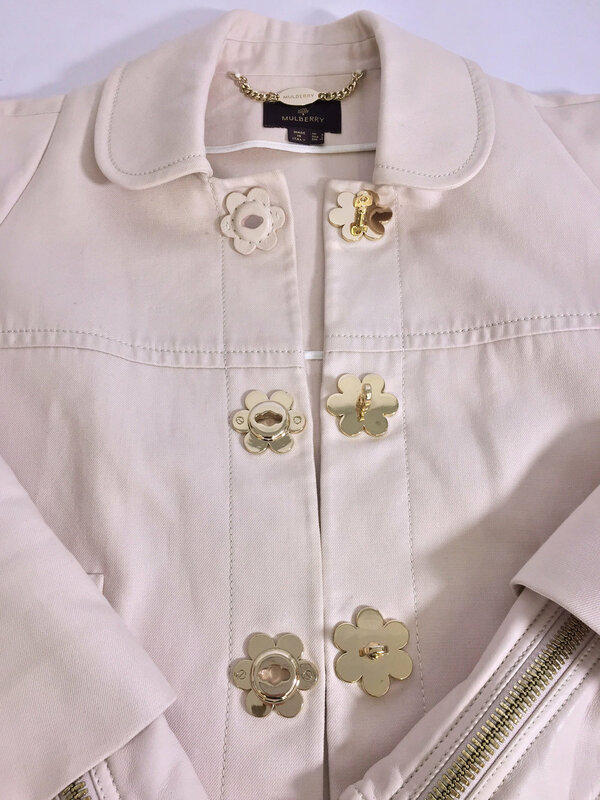 This time round client Emma Sinclair challenged us to restore her prized cream cotton and leather jacket from Mulberry. She had lost one of its unique fastenings which were large, gold, and shaped like a daisy, and there was no way she could leave it incomplete. Usually luxury brands have an amazing ability to source replacement buttons or fastenings for their products; but not in this case. The jacket was part of the Mulberry SS13 collection, a limited edition archive piece, which meant the hardware was no longer manufactured. Our Head of Atelier researched some options to find similar hardware for the missing scallop-edged closure. Unfortunately, nothing was a close match and an alternative fastening would not keep the aesthetic of the jacket’s original design, which was key to the repair process. Appearance and design are everything and this consideration goes beyond making an item solely functional. The creativity of our Atelier shone through with the inspiration to replicate the metal closure in leather. After creating the initial pattern, a hard material was chosen as a base to create the main structure. The raised shape was created using a technique called plugging; layers of leather or material are glued onto the base piece, then sanded on the edges to achieve a smooth finish. Once satisfied, it is then covered with a thin piece of calf leather. To ensure the fastening operated equally as well as the original, the hole needed to be perfectly centred and have exactly the same depth. The beautifully crafted piece was then hand painted and finished with a specialist edge paint to match the leather sections of the jacket. Our Head of Atelier then attached the flower by hand-stitching, instead of using miniature screws seen on the other fastenings. The stitching was a conscious decision to contrast the soft look of the leather to the hard style of the metal, perfectly complimenting the original design. The holes were marked and punched beforehand to facilitate stitching through the thick material with precision. On receiving the restored jacket Emma immediately contacted the team to applaud the work on her re-imagined piece. The Restory was thrilled to see her wearing the jacket on Channel 4 News the same week! The Restory works on a bespoke service. If you have an item in your wardrobe in need of some TLC, drop a line to service@the-restory.com. In the meantime read our inspiring blog post “If You Could Turn Back Time” for ideas on re-fashioning your most loved pieces. Together we can find a way. Today’s case study spotlights the 'Jamie' a classy python clutch by American designer Tyler Ellis. In this edition of luxe bags Tyler has combined the classic with racy materials in ice cream pastels. This is a statement accessory! The main body of the clutch and the handle are made from prized back cut python skin, also known as belly skin. The natural pattern in this skin is loved and coveted by its fashion loving owners. It is heartening to know that the seemingly delicate python skin is in fact extremely durable and if looked after well can outlive us! 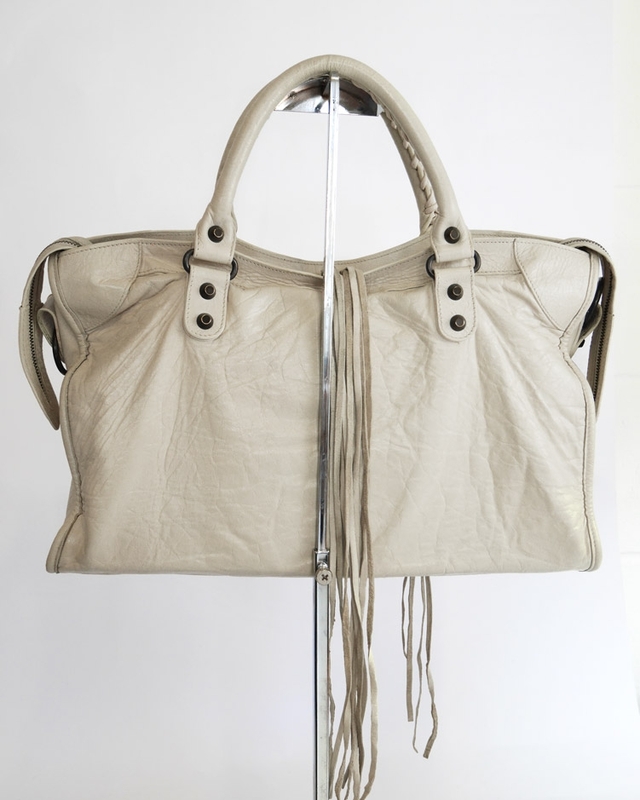 A client asked The Restory to save her beloved bag. The python scales had curled and through wear the colour had faded in places. We imagined it had been to a few fabulous parties that had left it looking a little jaded! We know that in time the natural oils in our hands can affect the leather to leave a worn patina. 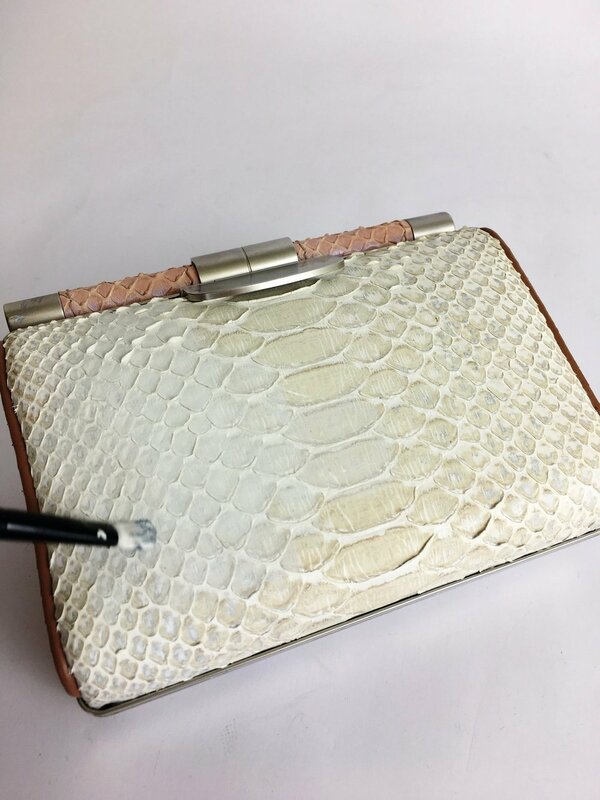 Our head of Atelier applied the hand painting techniques that are used especially for exotic skins to replicate the original finish. Our aim is to restore a piece to its original appearance in keeping with the designer’s vision. We work with a broad range of colours and dyes to restore and renew your accessories to look like new. 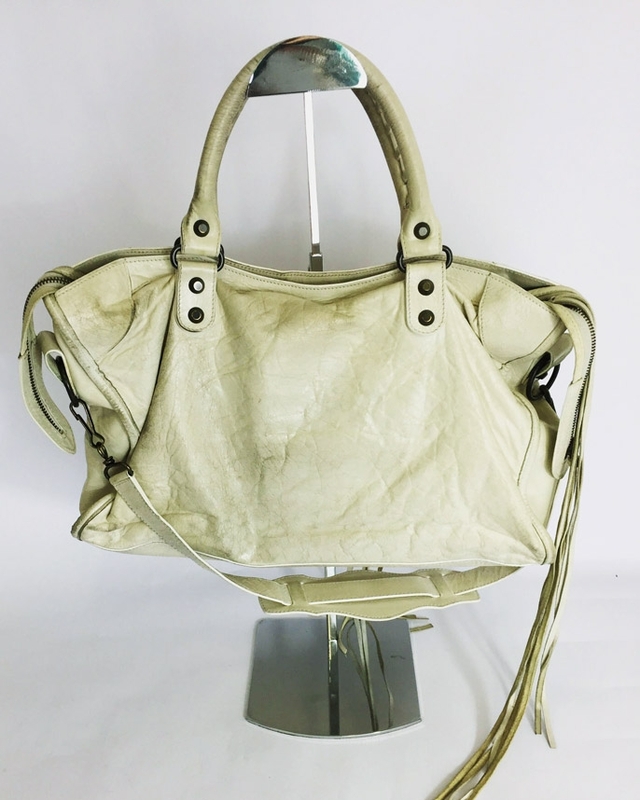 The worn condition of this bag meant that it was hard to define the colour but we succeeded in imitating the design using several shades of white and metallic finishes. The restoration of a skin is similar to revamping a piece of furniture. First, we strip back the old paint and then de-glaze the surface to ensure the best adhesion for the new paint colour. Finally, to make the skin look tidy we press the surface scales back into place to make them all point in the same direction. We chose a semi-opaque pearlescent silver finish that allowed the base colour to shine through retaining the original depth of the skin. After this we applied three thin washes one layer at a time and finished with a sealant to protect the colour for the future. The sealant also acts to give the skin a lovely supple satin finish. When we were satisfied with the overall appearance we gave the hardware a final polish to leave it looking like new. The 'Jamie' was ready to go on show for another season of fabulous parties! Always clean the bag in the direction of the scales to keep them flat against the skin and avoid damage. As designers become more ever more creative, so does their use of unique techniques, daring combinations of fabrics and made-to-order hardware. It can make a simple scuffed heel or torn piece of material seem utterly beyond fixing. At The Restory, we start with the premise that there is no such thing as unrepairable. Under our team’s skilful hands, a seemingly impossible situation simply becomes a great challenge. Disaster strikes: a client’s pair of black leather Nicole Fahari high-heeled sandals were thoroughly chewed up by her new puppy. And while we often breathe new life into leather pieces using like-for-like material mending, this location of the damage meant that it wasn’t going to be that easy. Time to use a new technique. To get around this tricky fix, our Head of Atlelier, Thaís, developed a custom solution involving (among other things) fillers, scalpels, acrylic paint and plenty of patience to rebuild and smooth out the damaged area. The client’s favourite shoes were returned to her as good as new, with plenty of years’ wear left in them. And the puppy is now with a trainer…but we had nothing to do with that part. 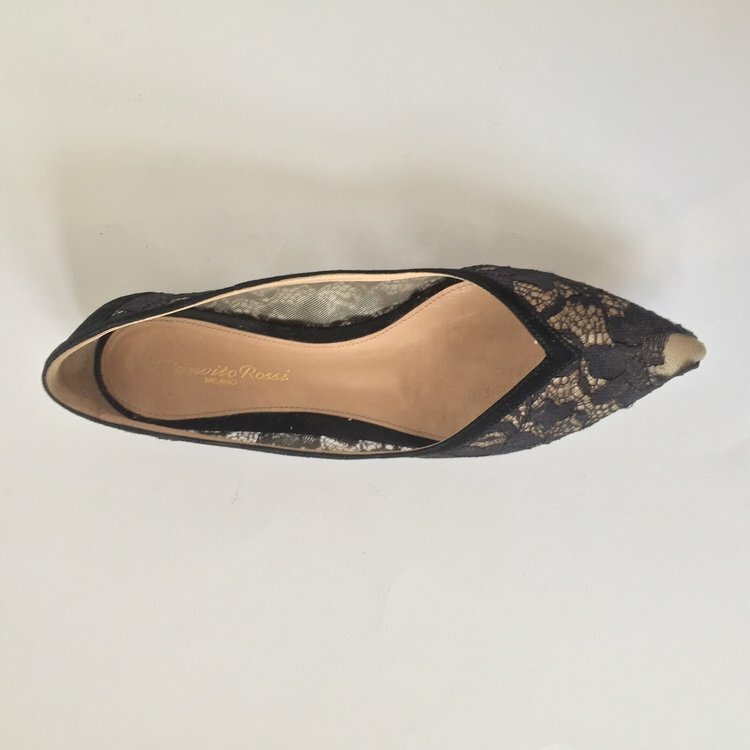 Some of the dilemmas we encounter require more than just skilful hands, but a wilful determination to find the missing puzzle piece.Beloved wear and tear meant this client’s lace-covered Gianvito Rossi point-toe flats were missing multiple segments of fabric.We went on the hunt to source an almost identical piece of lace, carefully cutting it to patch the holes – ever careful to make sure the patterns line up correctly. With a little persistence and the utmost care, you’d never know this pair of flats had ever been anything less than perfect. These J Crew pumps were presented to us in a very worn state. The multi-coloured glittered fabric had completely worn down on the heel, and time had caused them to become torn and dirty. Finding a suitable match for this one-of-a-kind fabric was out of the question, so this conundrum clearly required a more innovative approach. Using the tiniest of brushes and custom-mixed metallic paints in an array of colours, we hand-painted an imitation pattern straight onto the heel, seamlessly blending fabric and design to bring the shoe back to its original glory. Just when our client thought she had to say goodbye to her shoes for good, they were able to enjoy another Christmas party season. We’re exceedingly proud of the dedicated team we’ve built at The Restory. Dedication, team work and creativity have enables us to develop the most advanced techniques and stop at almost nothing to make you fall in love with your favourites all over again. Since the fashionable press hailed white as the fresh alternative to black, the rise in sales of the covetable white trainer soared. 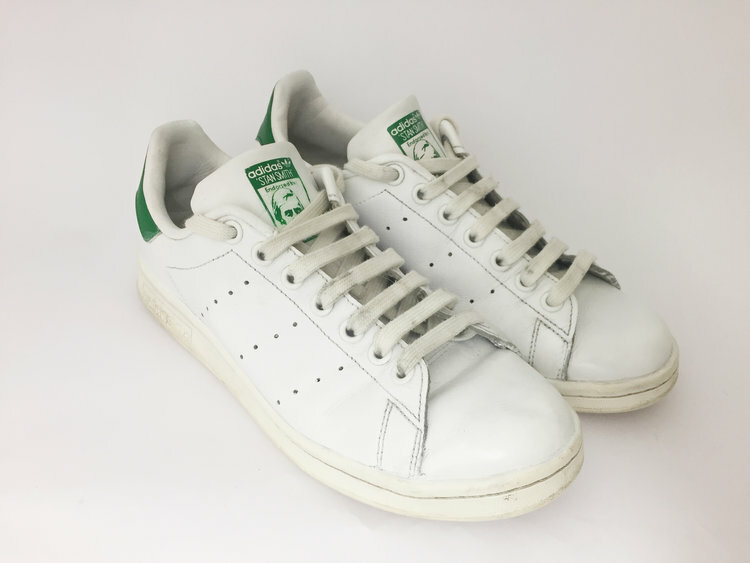 Most of our clients have at least one pair of white sneakers in their wardrobe, be it Saint Laurent, Stan Smith or Gucci. Personal experience proves this style is going to get dirty no matter how careful you are (especially if you have kids or dogs). But before you head to buy a new pair, let us show you what we can do that might save you time and money...all while doing your bit for the planet too. Using a combination of cleaning and colour restoration, we have come up with a formula to keep your sneakers at the top of their game for longer. 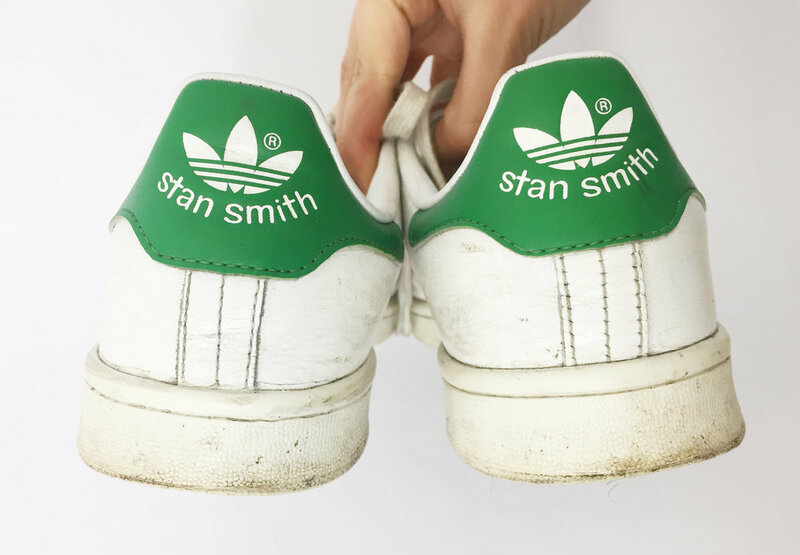 This case study shows a two-part restoration for what many would consider an ‘end of the line’ pair of white Adidas Stan Smith sneakers. 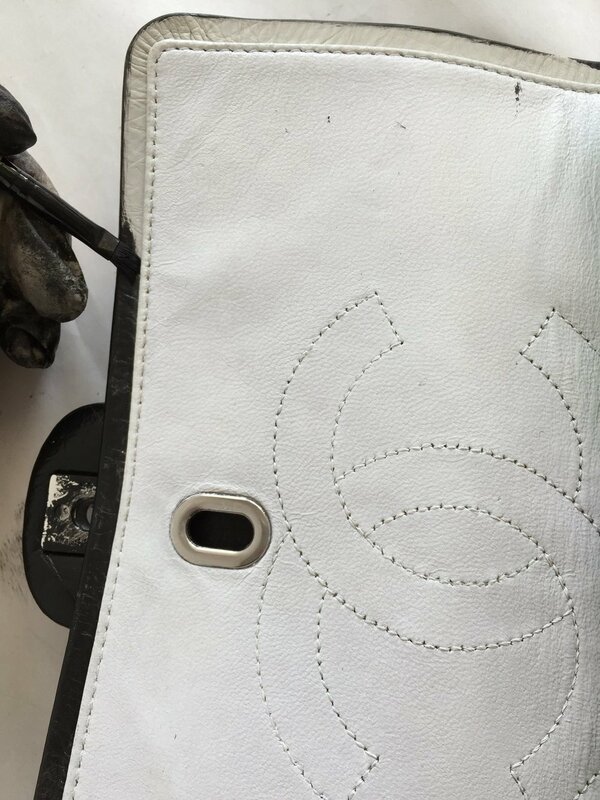 We start the process, by getting the shoes cleaned so that we can see the real damage on the leather. Sometimes we think they need re-colouring but surprisingly just cleaning can do wonders to it. The strength of the cleaning products vary depending on the difficulty to remove the dirt and stains, starting from mild to stronger cleaners and on to more chemical products. Laces are washed and ironed separately but also are often simply replaced. One very common problem with sneakers is that the rubber soles are very hard to clean and start oxidizing after a while becoming yellow. We combined some techniques to remove as much dirt and oxidation as possible from them. If the cleaning proves enough, at this point we would apply a protection cream to finish the process. After the clean, we prepare the shoes and remove the original finish in order to adhere the colour better. We take a less is more approach and use as little colour as possible to make the sneaker look fresh and avoid a heavy coating. By applying a sealant that will preserve the colour and restore the original finish. So while tempting to simply replace the, relatively speaking, less expensive trainer, know there are options to bringing back the bright and perhaps making your next sneaker purchase a bit more strategic rather than emotional.